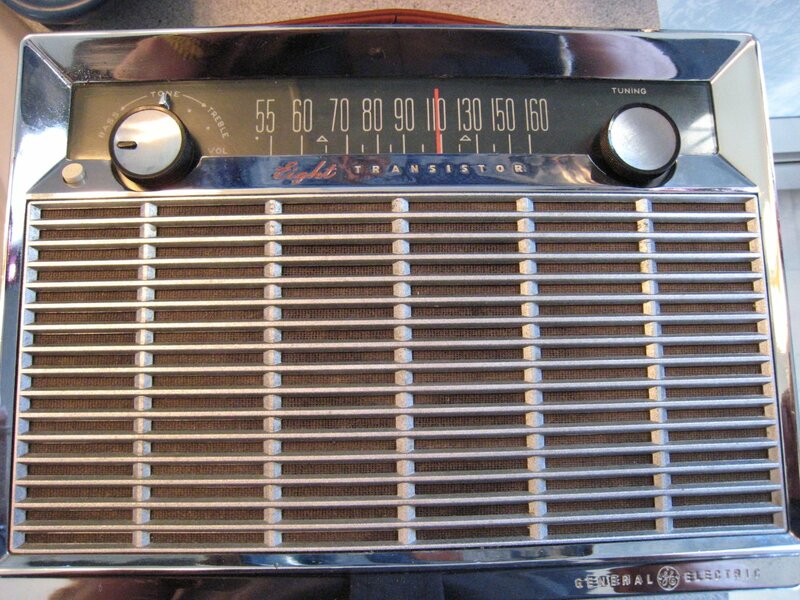 A few years ago I discovered a vintage AM radio model P780 made by General Electric. I did some research and found that some radio buffs refer to it as a predecessor to the GE Superadios. This interested me as the original GE SR (aka GR SRI) is one of my reference portable AM radios against which all others are judged in terms of their ability to bring in weak AM stations with low noise and good sound. 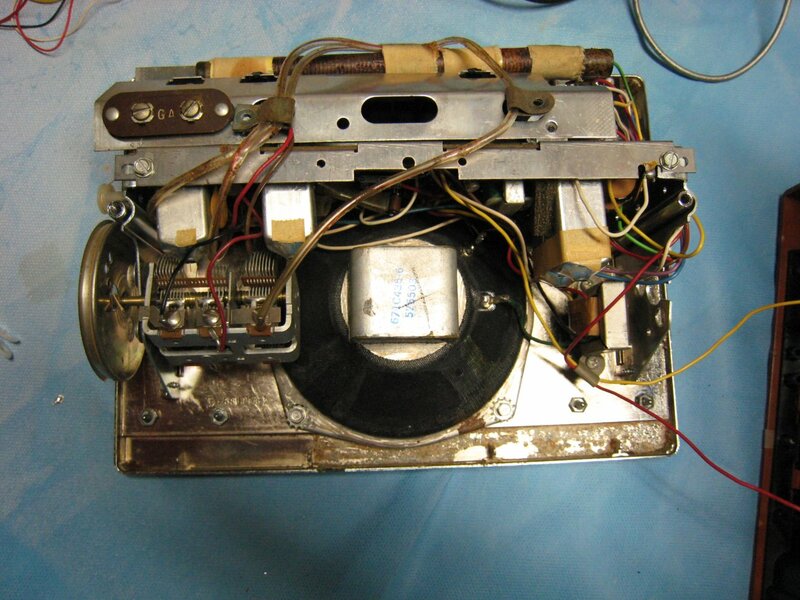 General Electric designed the P780 in 1958 at a time when tiny transistor radios were proliferating but their performance was generally well below what we had come to expect from tube radios of the day. Yes, “transistors” were cool and lots of fun but they didn’t sound nearly as good as a typical “All American Five” tube radio nor did they pull stations in as well. 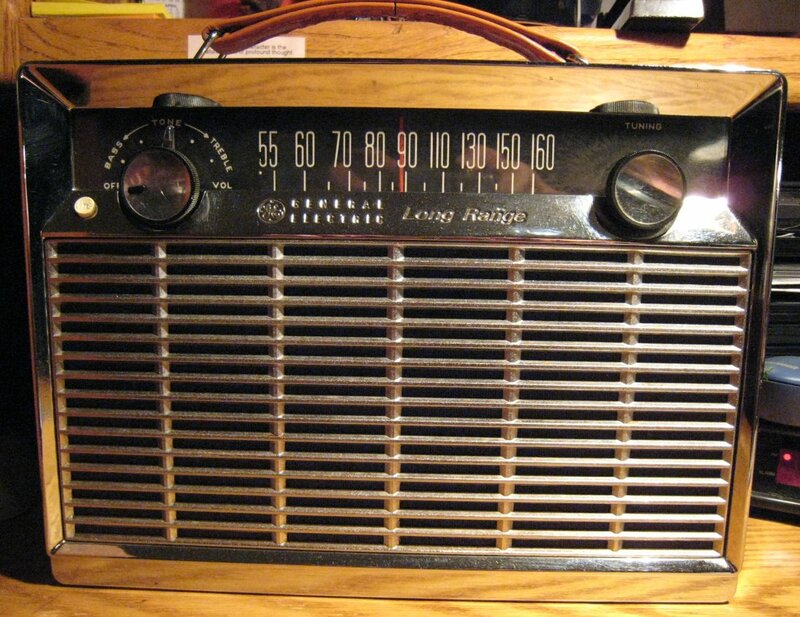 GE’s stated goal with the P780 was to design a full-size no-compromise transistor radio that would equal a tube radio’s performance in every area yet still be portable. I will tell you right here that they absolutely succeeded. The P780 series includes suffixes A, B, C, D, E, and H. There were primarily cosmetic redesigns later with the name “Musaphonic” on the front panel in models of the P783 and P784 series which are nearly identical to the P780H. I’ll mention some of the differences as I go along. I eventually obtained several P780′s, and later additional samples of each. It would appear there were only three major PCB designs, one for models A/B, one for C – E, and one for the H.
The original version, Model A says “Eight Transistor” on the front grill. The “H” version says “Long Range” on the grill and has no Conelrad markings. 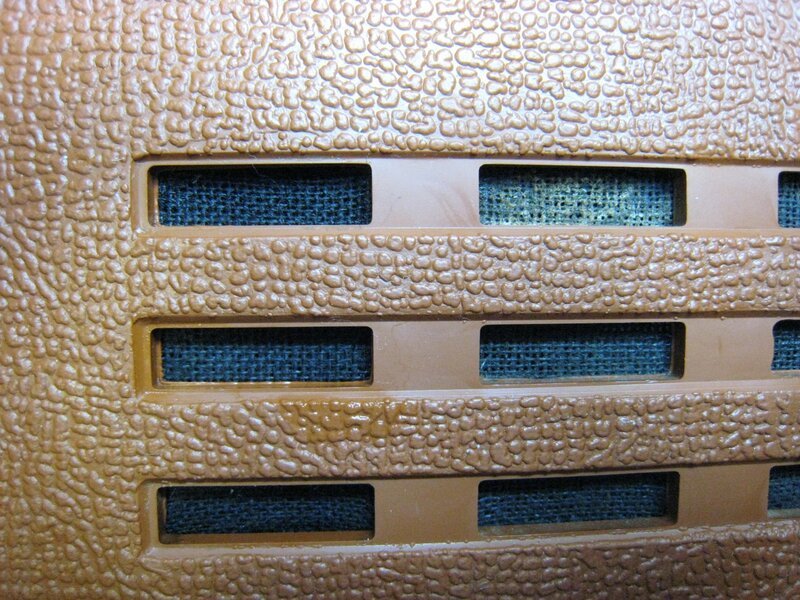 Dial lamps are mounted to the PCB in the A models, but mounted to the top speaker screws in the C-D and later units. 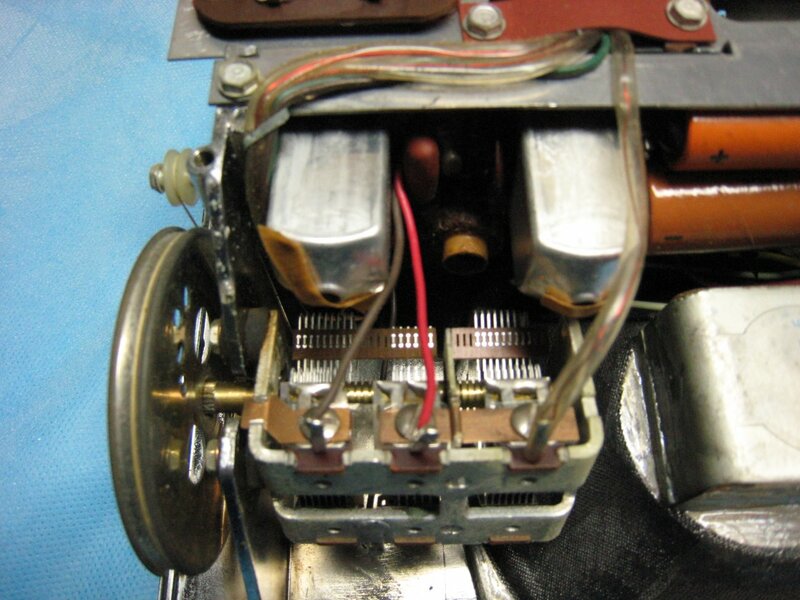 H versions added a 9th transistor…a bias regulator in the output stage. A redesigned audio output stage is the major electronic revision. It follows the same general topology but with updated components and the additional transistor.. Also note the audio driver and output transformers are both changed to new values in the H model. I already had owned the “H” for over a year but decided to get some of the other versions for this report. I figured if I went through four P780′s I’d likely learn a lot more than from just one. I was able to find some at decent prices on eBay and a few weeks later I had my four. The P780 has a striking physical appearance…something in it brought me back to 1958. 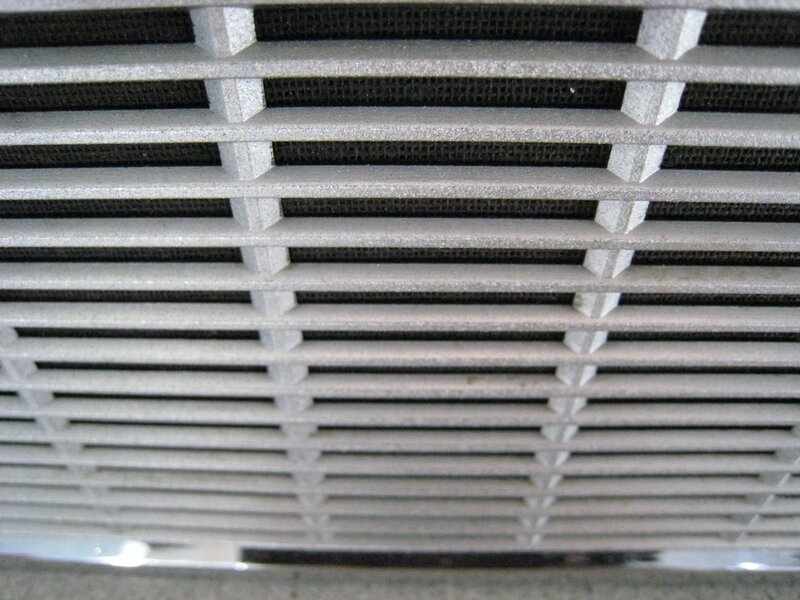 Its huge chrome grille reminded me of the cars of that year, in particular our Oldsmobile Super 88. This is one heavy radio, especially when loaded with 6 D cells. At its rated current consumption of 25 milliamps (which is playing at a medium volume) a modern set of 6 Alkaline cells will power it for 820 hours! When I got that “H” over a year ago it had some problems. It was not in the best cosmetic condition…it was dirty and had some paint splatters on it. In addition the radio squealed and howled as I tuned across the band, and when it was actually playing on a station it sounded weak and distorted, as if it were running on weak batteries (the batteries I had put in were new alkalines and tested fine). “No big deal” I thought…this is standard stuff with these older radios. 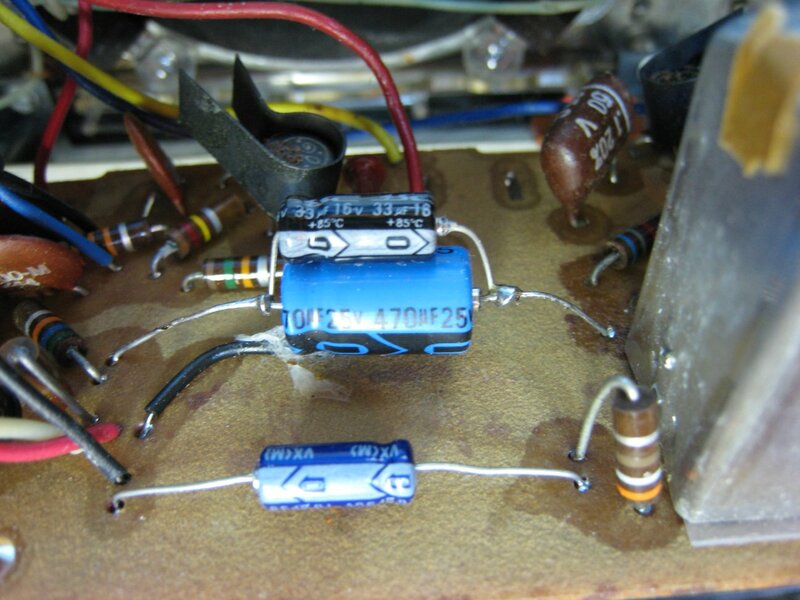 Probably the unit contained several electrolytic capacitors which had dried out which is common among older radios. Recapping is almost standard procedure for these old sets if you want them to perform at their best, or in some cases, at all. Needless to say working on four P780′s has been quite a learning experience. Incidentally, all four I have bought have been represented as working well and looking great, but all four fell far short of that mark when received – they all needed to be reconditioned or at least repaired before I could judge their true capabilities. It also re-enforced my opinions about buying vintage equipment from eBay…expect less than what the description says or you may be disappointed. Here are a few examples. I received a very nice looking “A” version. It was described as looking almost new and working well. But when it arrived it was jammed into a too-small box with no padding around its sides, and although the cosmetics were undamaged, the radio was dead as a doornail when I put batteries in it. 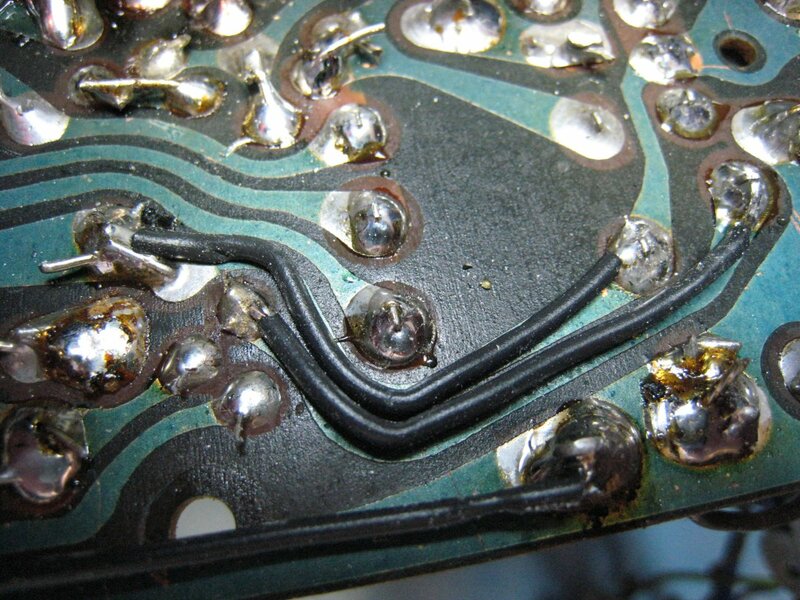 It took me a while to find the cause…a hairline crack on the PCB. Some quick continuity tests revealed three broken traces and when I repaired them (see pictures) the set worked normally. (Incidentally, the seller was an antiques guy with over 3000 transactions and a very high Positive Rating. I contacted him and I believed him that the radio worked before he shipped it. When I explained what had happened he graciously refunded more than half of what I had paid. I was happy with that as I wanted to keep this radio. Sometimes on eBay even a bad deal can be rectified if you keep a cool head). I received a second “A” or “B” version (no model sticker inside) which was described as “playing”. Well, it did work but not well. The sound was very weak and garbled…this one would need new caps at least. It was also dirty with more paint splatters on it. Then I got my “D” version. This one was also described as working well and wasn’t as weak as the last one. In fact I initially thought it was working normally until I compared it with others that were noticeably louder and stronger sounding so it would get new caps too. This is an interesting point – I may have believed this radio to be working to its full potential and if it was the only P780 I ever saw I would have underrated its capabilities. 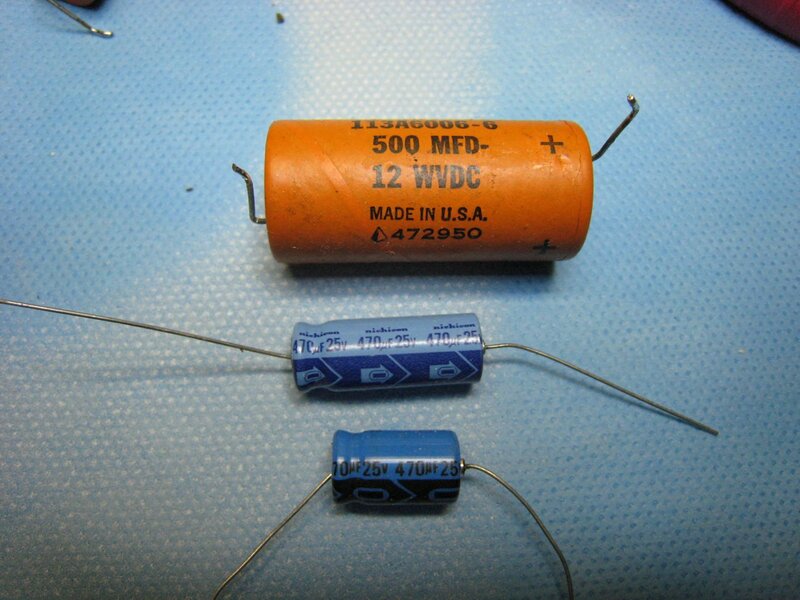 Although the effects of weak electrolytic capacitors are usually obvious – weak or distorted audio and less sensitivity – it can at other times be subtle. In this case the radio sounded fine until I put it next to another P780 which played more loudly and was more sensitive to weak signals. reveal the true cosmetics of this unit at all, while my photo was designed to reveal its flaws. Sadly many eBay photos are less revealing than I would like but that is the nature of the hobby. If you spend some time on eBay you will learn which pictures are truly revealing and which are not. The first unit I tackled was the P780H. Removing the back cover was easy…two screws. Luckily the wires from the battery pack are long enough to remain connected to the radio while you service it so if you don’t have a bench DC power supply you are in luck. 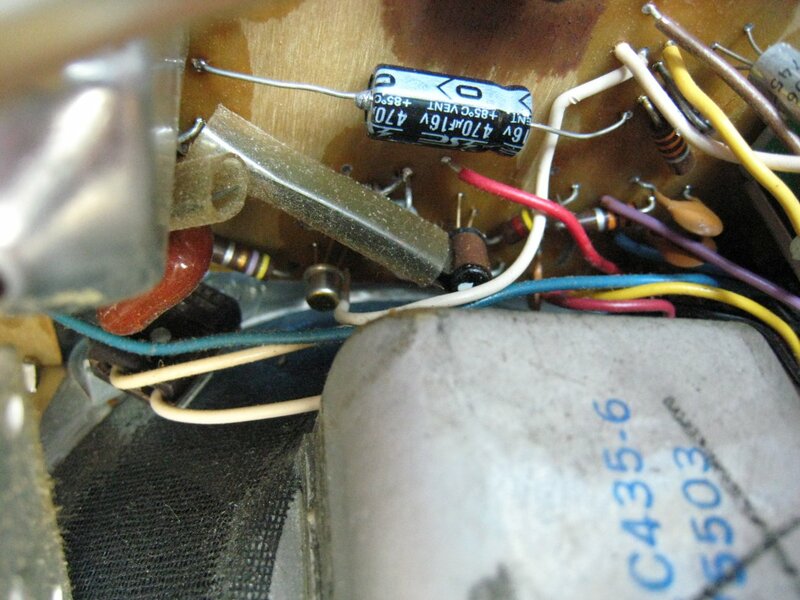 (Hint: If you are taking your first P780 apart, after you remove the back cover take a picture or make a drawing of the positioning of the wires going to the ferrite rod antenna and the tuning gang. When you re-assemble you should follow this positioning as closely as you can as it affects alignment). 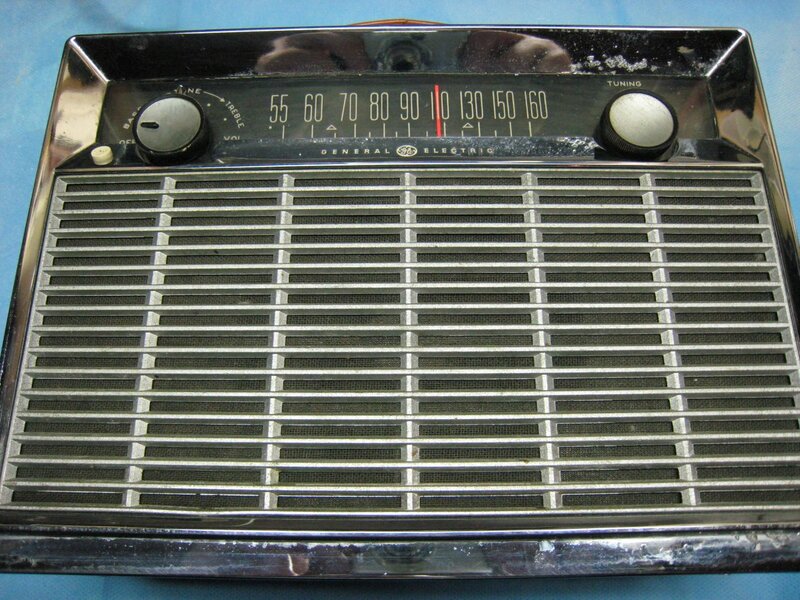 This so-called “critical lead dress” was slightly different on each of the radios I’ve looked at. 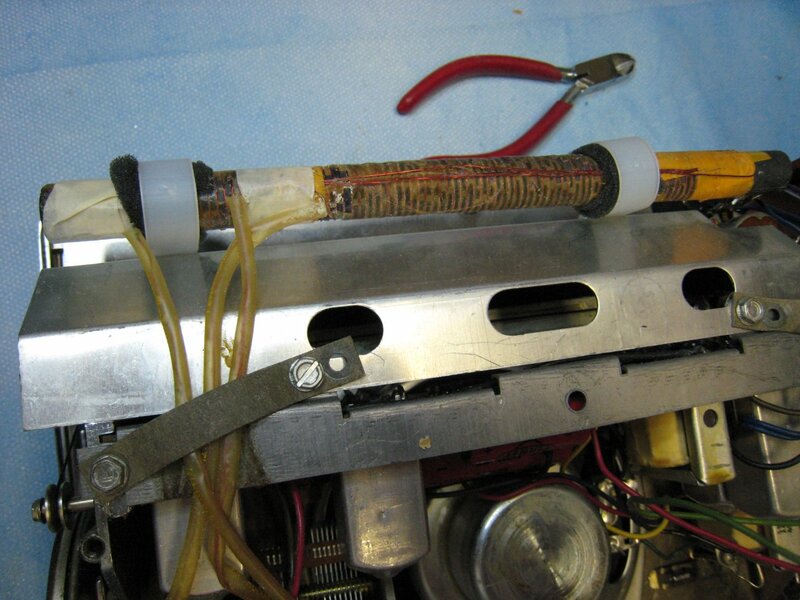 Looking inside I found a very large ferrite rod antenna approximately 8 inches long, a large PCB suspended upside down with metal rails extending around it for support it, a large specially-designed high efficiency 5″ speaker and a large, three-gang variable capacitor. The set looked like service would be fairly easy because everything is full-sized and not crammed together as in most transistor portables. There are some areas however that are not so easy to access, but the very weight and solidness of this radio gave me the conviction that fixing it would be a joy and well worth the effort. I discovered that one of the ferrite rod antenna mounting clamps was completely missing and the other was shattered to bits, with the rod hanging loosely inside. Luckily these are standard 5/8″ cable clamps. Of course I didn’t’ have the right size clamps on hand so I wrapped some foam around the rod so it would fit the slightly larger ones I had…the result looks good and works well. To partially access the main PCB I first removed the rear metal rail, removed the still-connected volume control…the additional slack this gave made it possible to slide the main PCB about half way out along it’s side rails…enough to replace the four electrolytic caps. Actually two of the caps are right on the rear edge of the board with easy access, but the two others are way at the front edge of the board…still, I was able to replace them without pulling the board out completely. Four 4 new electrolytics later I powered the set up. This time the sound was LOUD and it sounded healthy as I tuned across some stations. The squealing was also gone. However the sensitivity didn’t seem very good and my known local stations were far off their mark on the dial so alignment would clearly be needed. When all was said and done, three out the four radios I bought (all advertised as working well) needed new electrolytic caps. You will need one 470 Mf and three 10 mf caps for these radios. The original values are 500 mfd and either 6 or 8 mfd but the standard values will work fine. I hot-rodded one of my P780′s with a 470 plus a 33 Mfd cap piggybacked across it so the total would just about match the original 500 mf. In this application 470 would work just as well…this was done only as an exercise. Some P780′s use all axial caps…some a combination of axial and radial, but the replacements are so much smaller than the originals you can fit an axial in place of a radial and it fits perfectly. Some restorers like to keep the original cap’s cover to keep the look original…I’m mainly interested in using the radios I restore and go for the simple replacement approach…it doesn’t matter to me if the PCB looks original or not…as long as it looks professionally done and works to specs I’m happy. Three of the four radios had broken ferrite rod mounting clips, one needed a new dial string, I found one noisy transistor, a driver in one of the A’s output sections and all needed alignment. 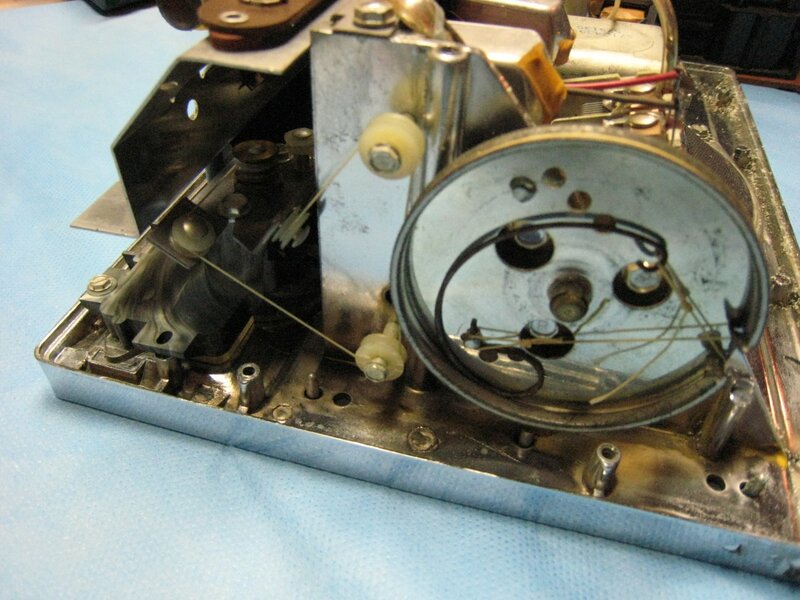 The dial stringing job is fairly easy on the P780 with good access and a clear diagram in the service literature. However when I was done the tuning was still slipping; the problem turned out to be the tuning gang itself was just too hard to turn. I tried the old tricks of WD40 in its bearings, followed by general cleaning and a drop of fine oil at each bearing but still it was tight. I put it aside and when I came back to it the next day it seemed a bit easier to turn…enough that it no longer wanted to slip but just to be on the safe side I applied some rosin to the string and it tunes just fine now. Alignment of the P780 is straight-forward but there are a few tricks I discovered along the way. Two nice touches are the dot at the far left hand end of the dial scale where the pointer should be when the tuning gang is fully closed; this is, when you are tuned all the way to the bottom of the band. If the pointer is somewhat off of that mark the first thing is to set it correctly. It was very easy to adjust this as there is a set screw where the dial pointer mounts to the dial cord which can be loosened and the dial freely adjusted. How nice is that compared to the typical radio where the string is crimped in a metal bracket and locked with glue or locking compound…this is a nice touch. Later you may decide to shift the pointer slightly higher or lower if it results in better tracking across the dial. If you take the time to do this you will be rewarded with a very accurate dial, generally right on frequency and less than 10 KHz error at any frequency. The alignment proceeded normally and when I was done I was gratified to find that the radio was a hot performer and the dial was reasonably accurate. This is one analog dial with fine enough markings that you can actually tell what frequency you are tuned to which I really love in an analog dial…and something the much later Superadio Series cannot claim to do. Tracking was not perfect but I figured I’d get to know the radio better by using it for awhile then revisit the tracking issue later if I felt the need to. I buttoned the radio back up in its case ready to do some dial twirling and see what it could do but the first thing I noticed was that the stations were all at the wrong points on the dial again! What had happened to my painstaking alignment – had something gotten knocked out of whack when I put the case back on? I removed the back cover and found that the dial was accurate once again. 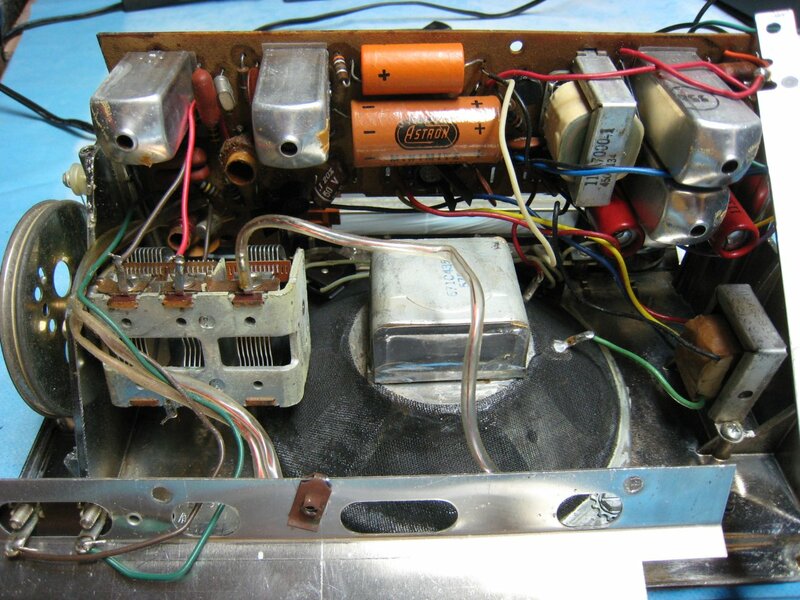 “What the heck” I wondered…then it hit me – the three wires running from the ferrite rod down to the three gang tuning capacitor were kind of sticking out of the back of the radio. I pushed them in towards the chassis and everything went out of whack again. Obviously the capacity between these wires and each other and the chassis and tuning gang is all super critical. 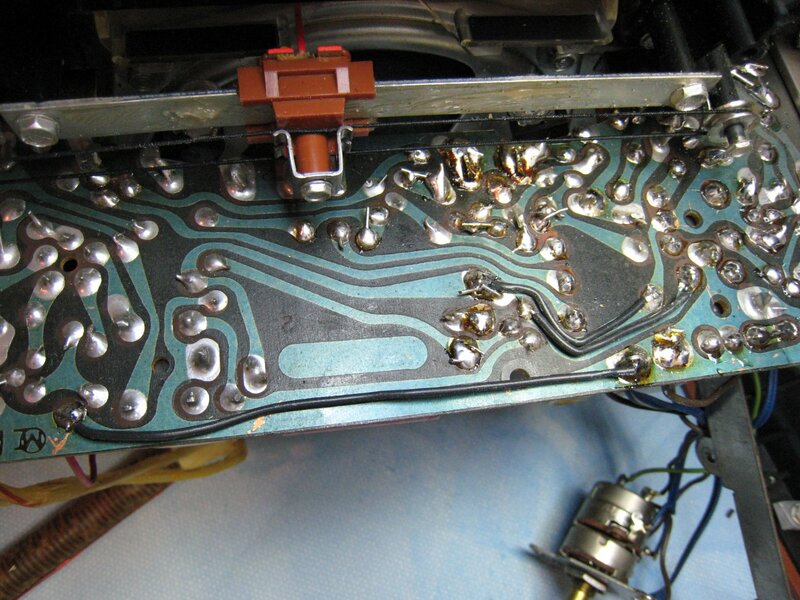 This is known as critical “lead dress”…where wire positioning greatly affects circuit performance. They must be clamped down in a proper position and held immobile for adjustments to remain stable. I repositioned the wires more carefully this time (the whole assembly with ferrite rod and its wires had to be removed to access the circuit board previously). I positioned them away from the tuning gang so it would not move near them and snugged them down in such a way that they would not contact the back of the cover when I put it back on. There is a mounting strap for holding these wires down…I made sure it was snug and that those wires were positioned as well as possible. I went through the alignment again…more quickly this time, just a touch up and this time when I put the radio back together it stayed in alignment. Another lesson learned. On three of the four radios the IF alignment was reasonably close. I would say their improvement was on the order of 5% or so…worthwhile and noticeable on the test bench but probably subtle under normal listening conditions. However, one of the four radios had both the first and second IF’s WAY out of adjustment while the third was reasonably close. I can’t tell you if they had been tampered with (although that is my suspicion), knocked out somehow in shipping or what but as I brought them back into proper adjustment the signal got immensely louder and stronger…this radio would have been noticeably less sensitive and selective without that adjustment. Dial calibration on all four of my P780′s ended up being very close across the entire dial scale, but some required a few attempts to achieve this. That is, I always start by following the alignment instructions to the letter but if dial calibration does not end up perfect you can sometimes tweak those adjustments just a tad and get it closer. There are a few ways to do this. It maybe as simple as starting out at a different top end frequency to see how the frequencies fall if you do that. Or you may find if there is an overall error you can move the dial pointer slightly to split the difference and get the average to be closer. With these P780′s even that critical lead dress I discussed earlier can make a difference…you can change alignment by moving some of those wires a very small amount. You also need to keep those wires away from the tuning gang as it moves through its range as this affects the alignment and tracking as well. The important thing is to understand the alignment process so you do not compromise performance – you can often improve less-than-perfect dial tracking yet still maintain peak performance…sometimes it just takes a bit of trial and error. You may also encounter a transformer coil that is stuck and won’t budge. Resist the urge to force it because the core can crumble leaving your set dead unless you can find a replacement. Sometimes it is necessary to open them up to free them but usually you can free them up without going to that trouble. If they are sealed with wax (they weren’t in the P780′s), judicious application of heat can usually loosen them to the point where you can adjust them. In my four P780′s there were a total of 16 adjustable coils (three IF and one low frequency padder) and only one IF had a stuck slug…it didn’t want to budge. I CAREFULLY tried a small screwdriver instead of the plastic or nylon alignment tools one normally uses but still no go. Since I had four of these radios I felt braver than usual so I gave the screwdriver a few light taps with the handle of a screwdriver and when I tried it again it now moved freely. 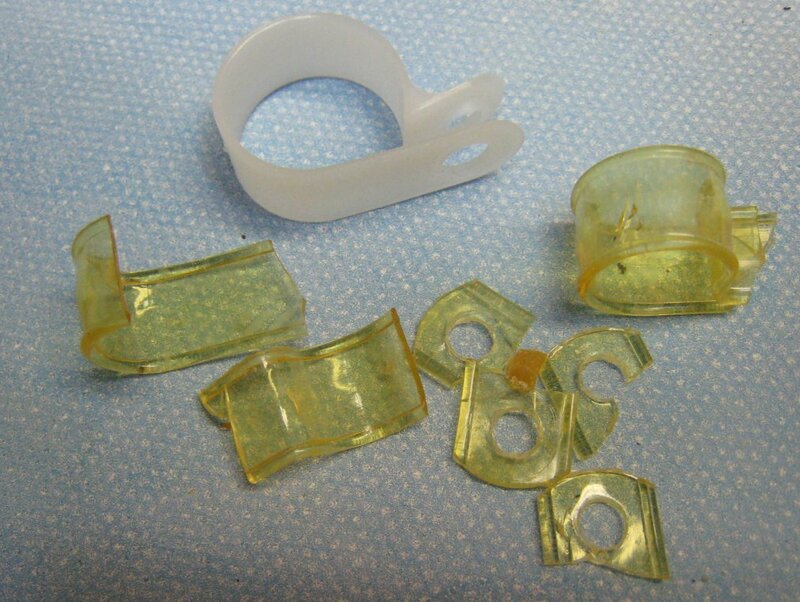 It’s a matter of feel…you have to use little enough force to avoid shattering the coil…better to have a stuck coil than a broken one…you can always take it apart afterwards if you have to. That caution being said I will admit to you this method has worked for me on several occasions and not since I was a young impetuous man have I broken a coil slug. 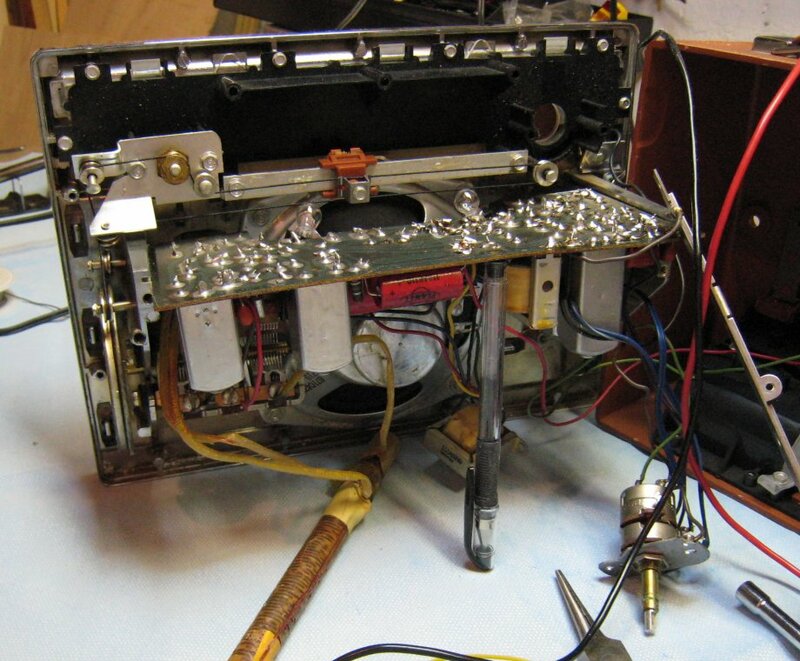 I learned the hard way as a kid by using a screwdriver to try to force a jammed coil adjustment…it shattered and I was done…as was the radio. The ginger-colored case is ABS plastic with a rough texture which again required some patience to clean. Mine even had a paint ring and some paint flecks on it. 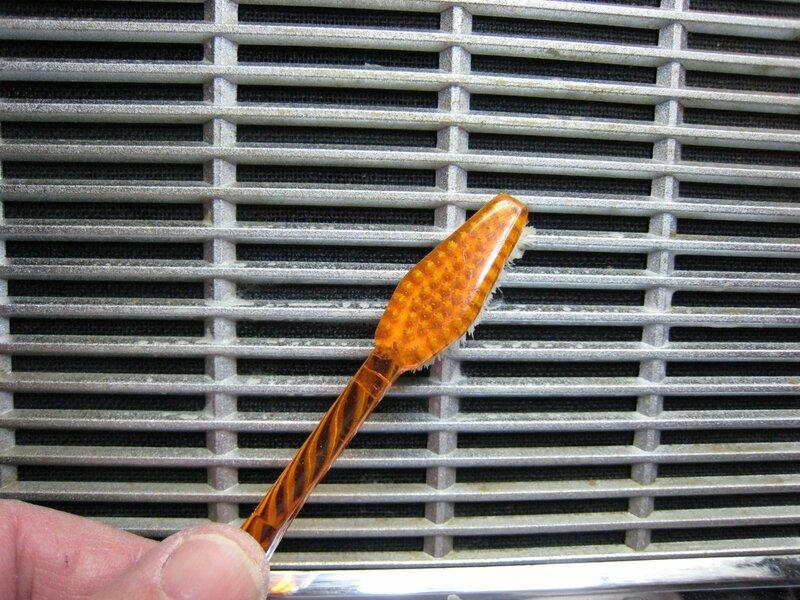 I again used glass cleaner and the toothbrush to scrub at it and I found the result was actually much redder than when I had first received it…a lot of black came off of it leaving the original color bright and clean looking. For the paint flecks I let the glass cleaner soak for a while then I used a toothpick to carefully scrub each paint spot away…the result was truly closer to perfection than I had hoped. The leather handles were generally in good condition but dirty…I used some more glass cleaner to remove some stubborn stains then Lexol to condition the leather. Chrome Polished – What A Difference! I cleaned the chrome and plastic dial glass with Novus Plastic Polish #1 and the knobs got soaked in soapy water followed by the toothbrush treatment. 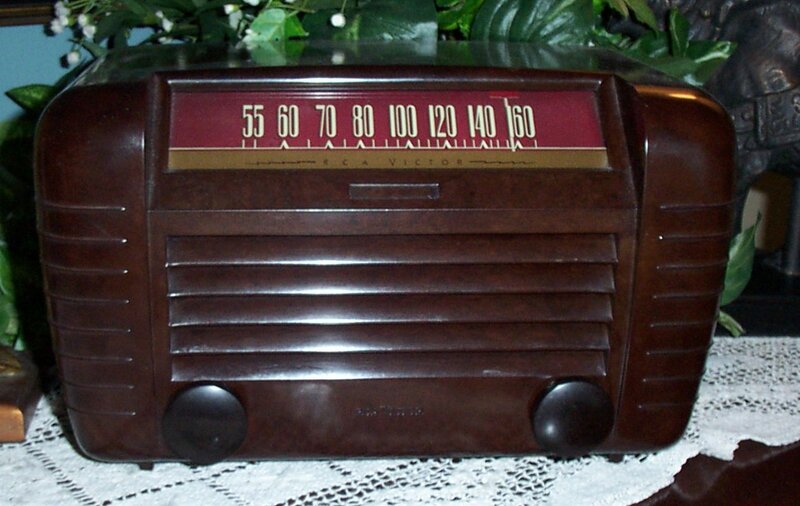 The radios really looked much cleaner and nicer when all was completed bearing little resemblance to the rather dull looking radios I had received. 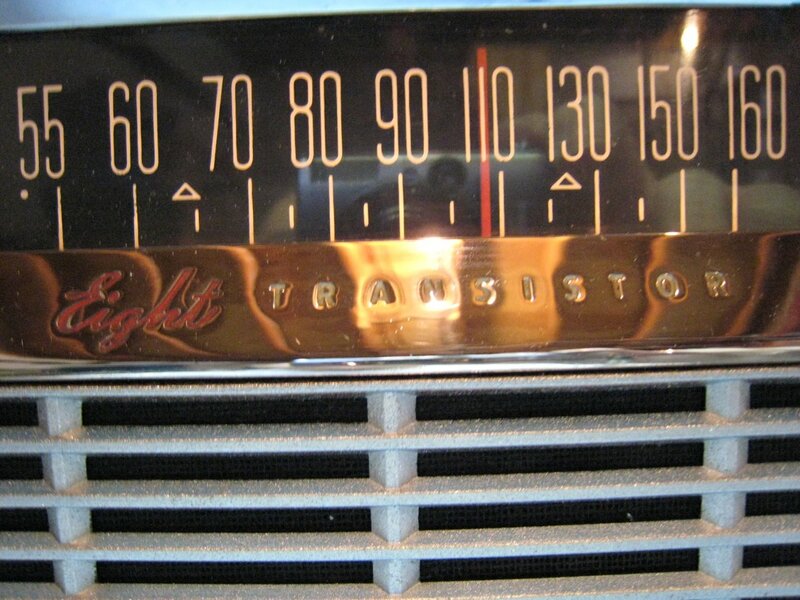 However if some areas of the chrome are flaking off, as on one of my radios, there’s not much you can do about it so if you’re scouting for one of these, be picky about whether or not the chrome has pitted or flaked. I was going to relegate my slightly pitted set to become a parts donor, but it is working flawlessly so I won’t dismantle it. Maybe someday I’ll get a perfect front plate for one and I’ll have the perfect chassis to go into it…you never know. 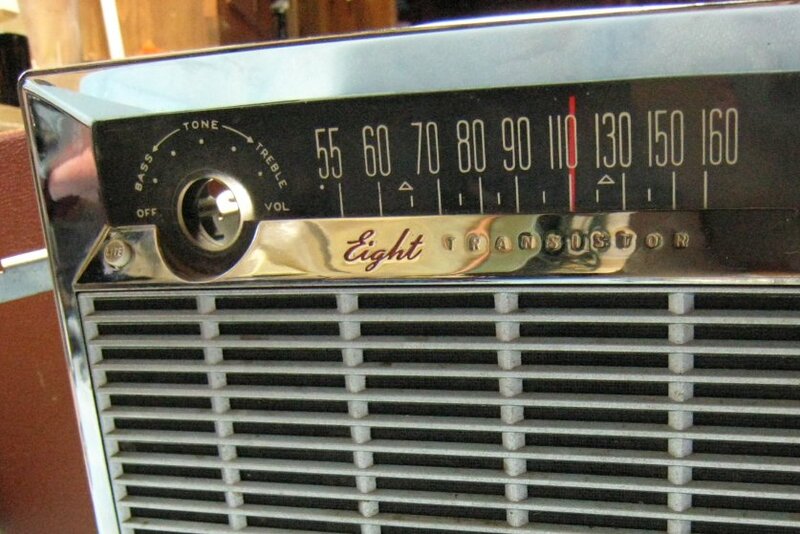 The GE P780 radio is a true joy to an old analog radio lover like me. 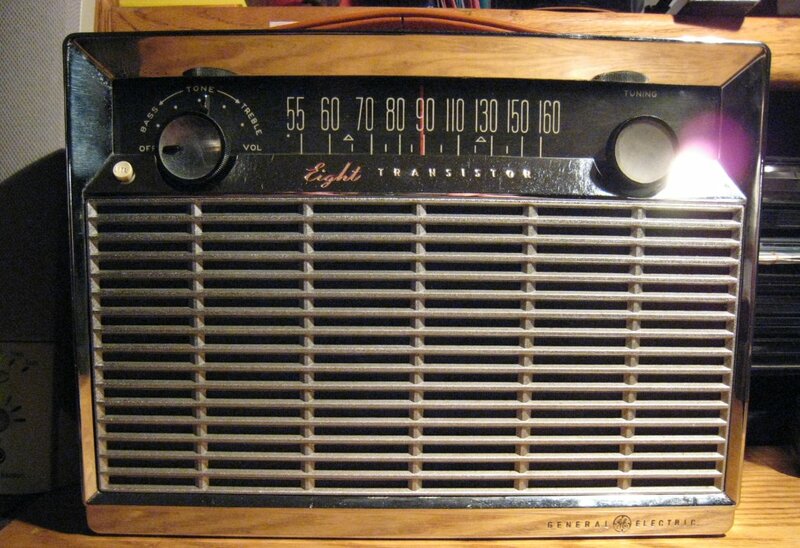 It was General Electric’s intention to produce a transistor portable with a robust tube-like sound and it still sounds good today. The P780 is a joy to listen to. Its 1 watt amp and 5″ speaker pour out a warm sound very reminiscent of tubed radios. It has a natural warmth and body that are very pleasing. I had a 500 mile-distant station tuned in with an oldies show in the workshop one night and I felt like I was in the movie “Christine”. The radio’s appearance virtually screams “1958″ at you and if you remember that period fondly looking at a P780 will take you there. Ergonomics are as simple as it gets and this heavy radio feels as solid as a brick. The P780′s emerged as truly hot performers. Across the four samples and three versions I have I was surprised that the only differences I can find are slight differences in sound quality…they have sutble sound differences I can’t specifically account for. One of the A’s has a considerably more powerful sounding bass than the other three radios. The H has a slightly cleaner and leaner sound than the others, and the remaining A and D sets seem similar to each other and roughly in-between the first two. 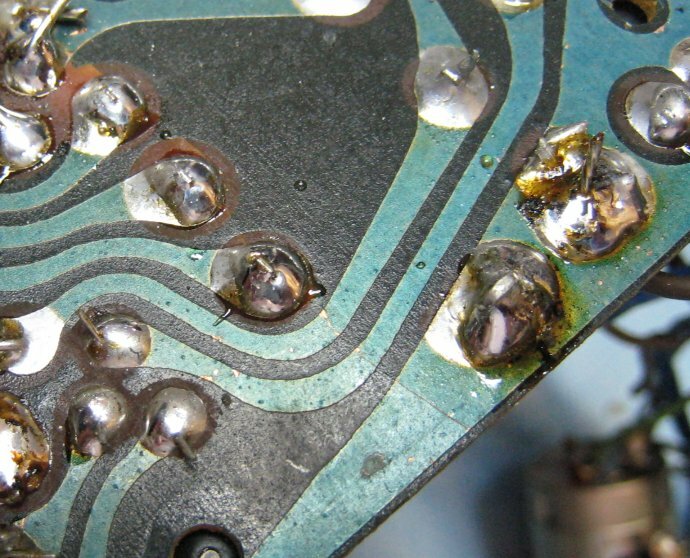 GE was in the habit of substituting different components including transistors depending on what happened to be available – that might account for it. For now I’ll have to leave it with the comment that they seem to vary more in sound quality than in reception…again, not what I would have expected. But all sound tube-like in the best sense of the word. The RF performance of these four radios was extremely close if not identical…a far cry from how they worked as received. 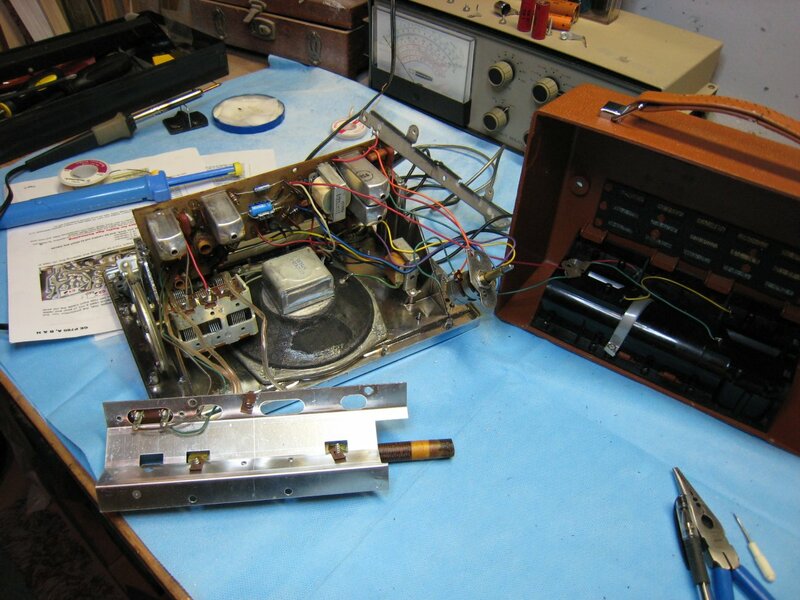 It is gratifying to recondition four radios that are almost 50 years old and have their RF performance emerge so similarly, especially considering that there were many changes in the circuit components used from run to run. Tuning around my familiar daytime AM band the P780 seemed super sensitive…everything I expect to hear was there and with authoritative reception quality and sound. Very impressive. The next step was to compare a P780 with some other respected AM radios to get a sense of how it performs overall. P780 versus Zenith Royal 755 from 1959. This was a top quality Zenith set, only one notch below the Trans-Oceanics featuring a three gang tuning condenser with Tuned RF and a 4″ speaker driven by a 275 milliwatt amplifier. (The P780 by comparison offers a full 1 watt audio output into a 5″ speaker in a larger cabinet). To be fair the Zenith was a smaller concept radio…”lunchbox sized”…the P780 is about one-third larger. The two radios were fairly close in terms of RF performance, especially at the lower parts of the AM band, although the GE was just a bit less noisy on weak to medium strength signals. Near the middle and upper ends of the band the GE was noticeably better on weaker signals. The GE was also more selective, separating adjacent channels adequately while the Zenith showed a bit more sideband splash. And my Part 15 in-home transmitter operating on 1580 KHz caused the Zenith to bleed over two channels to obliterate a weak signal on 1600 which was received easily on the GE. However, in real-world listening tests the Zenith seemed to perform far batter than this test would indicate. When the Zenith didn’t have to contend with an unusually strong local signal it was able to separate adjacent signals adequately, but the GE clearly demonstrates better front end dynamic range, AGC and selectivity when conditions are tough. The Royal 755 is no slouch – in fact it is far better than most AM portables its size and being smaller it is easier to carry around. Sonically there was no comparison. Simply put the GE sounds like the larger, more powerful radio it is far outperforming the Zenith. The Zenith sounds like a good transistor radio but the GE sounds like a big, tube radio. P780 versus Redsun RP-2100 The Redsun is a current model with an excellent price/performance ratio and is definitely one of the better AM radios available today. The Redsun is a hot performer overall but on the very weakest of signals the P780 was just a bit less noisy. They were very close though and sometimes seemed identical at the bottom end of the bad, but again, the GE seemed to improve at the upper parts of the band.. The Redsun’s audio was more neutral than the tubey-sounding P780…the Redsun is a very good sounding radio and is very clean and natural sounding overall. P780 versus GE SRII: The result of these comparisons is that they were closer than I had expected. In fact it was initially difficult to distinguish any differences in reception quality between the SRII and the P780, but after a while it became evident that the two radios were similar to each other near the top end of the band but the SRII was slightly less noisy throughout the middle and bottom of the band. After a rigorous comparison session listening to very faint signals at the threshold of audibility (signals one would not normally listen to) and also medium strength signals which are solid yet noisy it was clear the SRII was the overall winner by a small margin. But these were fairly subtle nuances…the P780 seemed to equal the SRII much of the time and on any reasonably listenable signal there were no real differences in reception. This is excellent performance as the SRII is one of my two “reference” portable radios for tough AM reception (the other is the Panasonic RF-2200). In all my AM tests over the years the RF-2200 emerges as the very best, the SRII just one small notch below it and now the P780 just one notch below the SRII. While coming in third may not sound that spectacular remember the differences are subtle under most conditions and ALL THREE of these radios offer absolutely superb AM reception, far better than most others. This was more than I expected from the P780, and along with its styling and sound quality it has become one of my favorite ‘nostalgia radios”. In terms of audio on the other hand, the P780 and SRII couldn’t be more different. The P780 is warm and lush and its bass response audibly goes much deeper than the SRII. Its sound draws you into the program, but you also have to put up with less cleanness – the SRII has audibly lower distortion. I can enjoy each depending on my mood. The romance of the P780 is fun when you want to bring back the old days – the way it looks, feels and sounds will bring you right back to 1958. And its lighted analog dial is a joy compared with the dials of the SR series which only let you guess where you are tuned. The SRII on the other hands always matches the P780 on tough signals and occasionally outdoes it by just a hair. Buying a P780 requires some strategy. Of the four I bought, NONE was perfect as received. Two of them appeared to work reasonably well until I compared them with others that had been repaired at which time I discovered they were in fact sub-par and in need of some reconditioning. 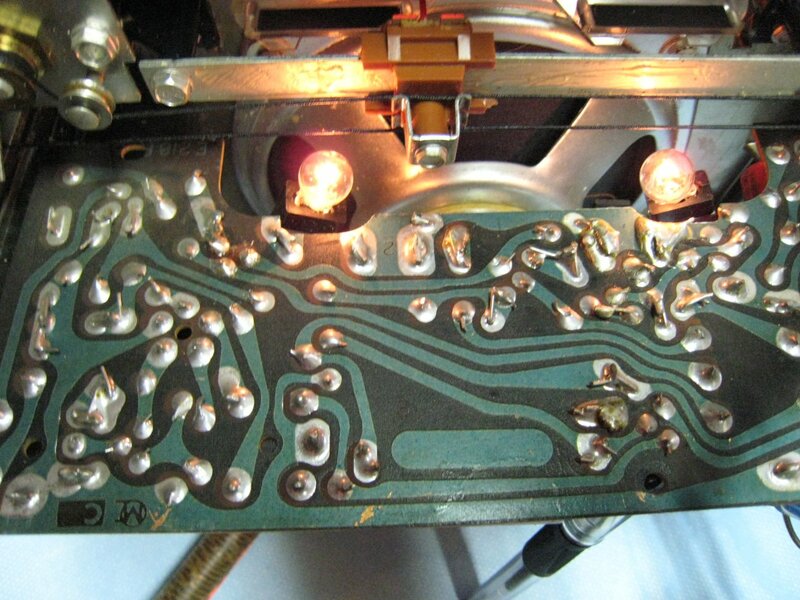 With the exception of one noisy transistor in one of the units, all ended up with virtually identical performance after recapping and alignment and that is a testament to the straight-forward and robust design. They all needed various small repairs ranging from replacing the broken ferrite rod antenna mounts, to repairing PCB cracks and replacing one dial string…all typical stuff. 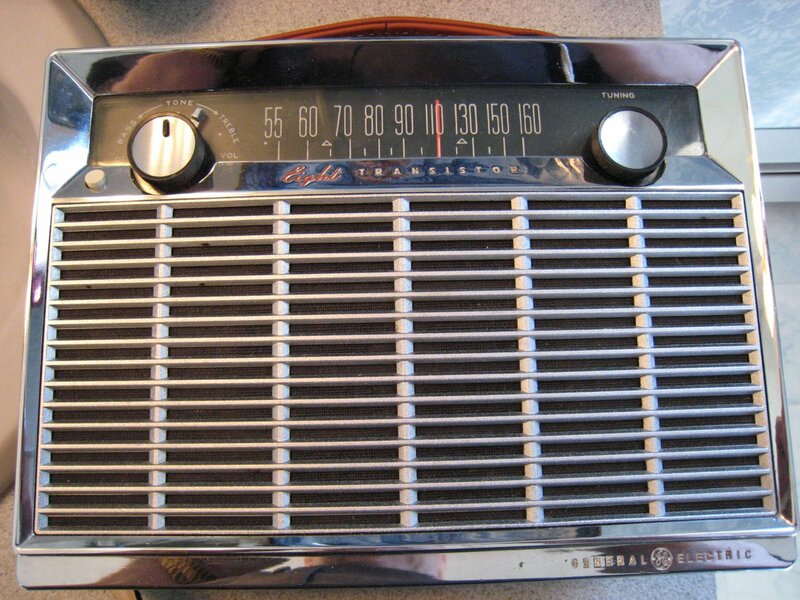 If you enjoy tinkering with old radios the GE is a fairly easy set to work on. 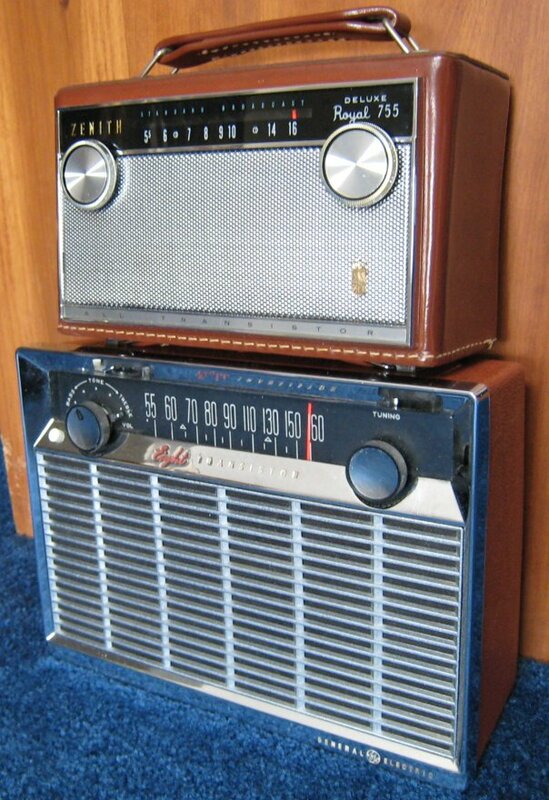 If you merely want to buy one to use you will have to be very pointed in your questions to the seller about the operational and physical condition of the radio before you buy because at 50 years of age and counting it would appear most of these need some TLC to be all they can be. The GE P780 is by all measures a classic…a benchmark product that, because it adheres to the tried and true, still impresses today. The most extra-ordinary thing about it is that GE was bucking the trend toward smaller and cheaper pocket transistor radios by going all out using modern solid state technology to simulate tube-like performance and that they succeeded so well. I even did some side by side tests of a P780 with an RCA Victor tube radio from 1946, model 65X1, which has also been fully reconditioned. 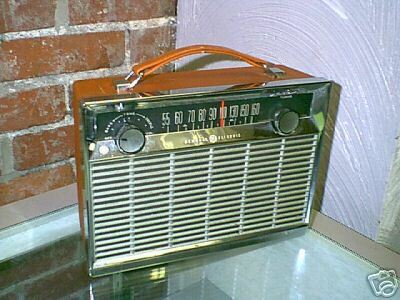 The P780 outperformed the tube radio overall in both reception and sound quality. It is obvious that they actually sought to emulate tube performance by tailoring the sound to have a characteristic just like many tubed radios of the time…what you might call “warm and fuzzy”. Technically it refers to a bit of eq – some bass and presence boost. When you push the audio to its limits it tends to distort gradually and gracefully…a sound we once all considered to be the norm. Since that day many products have come along which have outperformed some of these classics, but generally a real classic retains its appeal for whatever it was that made it special in the first place. For the General Electric P780 it was a winning combination of 1958′s most modern look, quality, sturdiness and superb performance. They are all qualities I admire in it today.